I’ve been craving a lot of Asian food lately. We’ve been eating so much curry that we decided to invest in a quality rice cooker—our old one was a cast-off from friends. After doing a bit of research, we ended up purchasing a Zojirushi Micom Fuzzy Logic 5.5 Cup Rice Cooker , and we’ve already used it at least half a dozen times. It takes up a bit more storage space and requires slightly longer to cook rice, but it is lightweight and has a useful handle, rice paddle, and shockingly nonstick bowl…and did I mention it cooks and warms rice perfectly? Because it can keep rice warm for up to 12 hours if necessary, I can pretty much get the rice going anytime in the afternoon that I have a free moment, and it will be ready to eat whenever I get to dinner. Anyway, I think part of my current interest in Asian cuisine may stem from the fact that, once the ingredients are prepped, it often cooks rapidly—even more rapidly if I just send my husband for take-out. Heh. My favorite Chinese restaurant dish is the one that goes by the name of orange chicken at Panda Express (but is sometimes called mandarin chicken or even sesame chicken at other restaurants I’ve visited): you know the one, with bits of chicken deep-fried and coated in a sticky-sweet, tangy, and often slightly spicy sauce. So I tend to gravitate toward trying recipes that promise crunch and tangy orange-flavored sauces. I’ve made two in the past few weeks, as it happens. My first stab was at the Shun Lee Palace’s Crispy Orange Beef, and it was alright. I did use pre-cut stirfry beef instead of cutting my own, so the meat was probably not of the quality it might have been, but hey—time is a precious commodity around here these days. The beef was incredibly crispy after coming out of the oil, but not so much after having been tossed with the sauce, despite serving it as quickly as possible. I’d like to know how the Chinese restaurants keep their deep-fried meats crunchy. 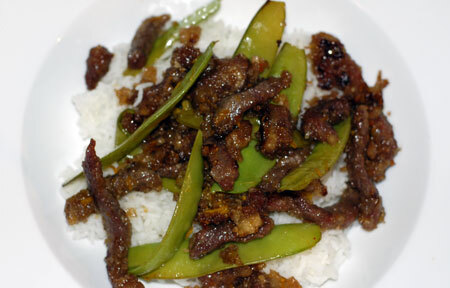 I also stir-fried a few snow peas with the beef right at the end for some green veggies. In a bowl, mix the steak, baking soda and water, and marinade in the refrigerator for 4 hours or overnight. The baking soda will tenderize the meat. In a wok, heat salad oil until smoking. To the steak, add the egg white and corn starch, and mix thoroughly. In a bowl, mix sugar, vinegar, sherry, soy sauce, and 1 teaspoon of corn starch. Fry the beef in the hot wok for 20 seconds, remove, and drain. Clean the oil with a slotted spoon. Return the beef to the wok, and fry again for another 30 seconds, remove, and drain. Discard the oil, and to what remains in the wok, add scallions, beef, sesame oil, sherry-soy sauce, orange rind and juice, and chili paste. Stir-fry for 30 seconds. Remove from heat and serve immediately over rice. My other recent stab at these flavors took the form of the Sesame-Orange Chicken from Elise at Simply Recipes. I didn’t manage to snap a photo of this meal, but it came out alright. My chicken was a bit burned on top and a bit soggy underneath; I can’t remember now exactly what I was doing while it cooked, but I imagine it had something to do with a baby. Anyway, I served it with some fresh skillet-cooked broccoli, and boiled down the marinade to drizzle back over the finished chicken and rice for sauce. It tasted good, and was easier to make than the beef dish, but every time I make an orange chicken dish that involves marmalade, it comes out with a bitter edge that just doesn’t quite work for me, and this was no exception. I’d still probably make it again—especially since I have an open jar of marmalade in the fridge now—but I’m still on the lookout for a recipe that reaches closer to my ideal. Maybe this one should be next on the list? I have the same problem when I use marmalade based recipes. I found a great one that I am under “orders” to make once a week at our house. And it is soooo very easy. I can make it in 30 minutes from defrosted chicken to table. It is missing the crunch factor but i am going to try a tempura batter on the chicken next time & see how that goes. The beef one sounds interesting might have to give that one a try this weekend. My in-laws got me a rice cooker for Christmas a few years ago. I never thought I wanted one, but it gets used a lot!! This sounds good – I don’t think I’ve ever made orange chicken or beef before. It sounds delicious! Carey, sounds great! Care to share the recipe? Deborah, I’m amazed at the amount of rice we’ve gone through since purchasing that cooker. Our old one was no longer non-stick, so it was a pain to clean and I avoided using it.